As is true with most dental procedures, the “best way” to perform a simple composite restoration is largely based on personal preference. A successful restoration can be achieved with a wide variety of instruments, materials, and bonding agents. 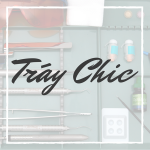 In the sample tray setup we have arranged below, we feature 15 of our most popular and most highly recommended items for accomplishing this procedure. Patients look to you to be their single source for everything they need to rebuild their tooth structure, and you can always look to us for everything you need to do so! 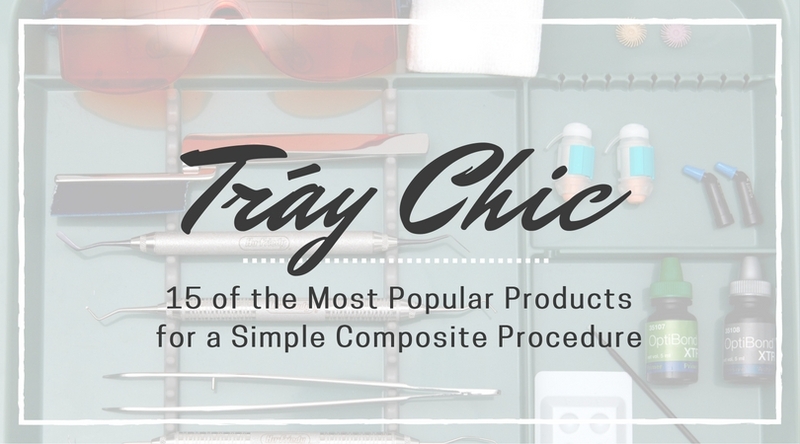 Here you can see the entire tray setup, stocked with great products and solutions that will help you through every step of a simple composite procedure. Below we will provide a description of, and shopping links for, each item pictured. 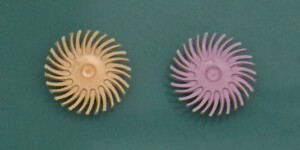 Items are listed in counter-clockwise order, starting in the upper left-hand corner. Everything in its place, and a place for everything. This divided setup tray from Zirc is definitely a great place for everything! 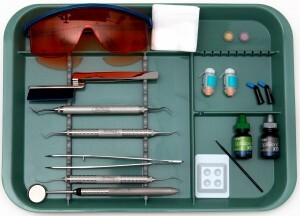 In addition to the plentiful, convenient divisions, this tray also features a locking cover, which keeps sterilized instruments and materials protected until they are ready to be used in the procedure. Talk about efficient infection control, right off the bat. 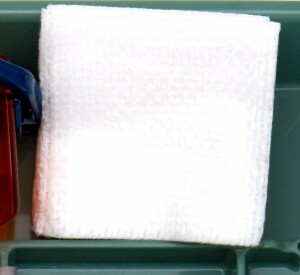 Infection control doesn’t end with a tray. Protect yourself, your staff, and your patients with this pair of protective eyewear from Palmero. They’re not just tinted orange for fashion’s sake, the warm hue guards against the blue light emitted by the curing light! They may be tough on protection. but this eyewear boasts a lightweight, comfortable, contoured design that “hugs” the face. Patterson brand articulating paper is proudly made in the USA and features a special carbonized, bonded paper, which makes for better ink acceptance during occlusal adjustments. Each sheet is pre-perforated for added ease. Working in perfect tandem, Hu-Friedy’s forceps are a very handy tool created specifically for securely grasping the paper! Hu-Friedy is a trusted name in the dental biz for good reason. Their reliable, high-quality Satin Steel XTS® instruments can be used to shape, file, and place both composite and plastic material. Their similarly sturdy double end excavators will assist you in efficiently giving carious dentin the boot. Pliers function as the perfect “middle man” as they deftly grasp or transfer materials in and out of the oral cavity. These particular cotton pliers from Hu-Friedy are made of heavy-gauge, heat-treated stainless steel, in order to prevent any misalignment or tip bending. The sickle probe on Hu-Friedy’s explorer is designed to explore an entire dentition with a single instrument. We recommend using this particular tool for carving and packing, since the composite material will not stick to it. Furthermore, due to its sophisticated makeup, the color of the instrument will not leak into the composite material which means that the material will remain the true tooth color you intended. This is one of many curing light models that Patterson caries. It features newer LED light technology, versus the older halogen style. 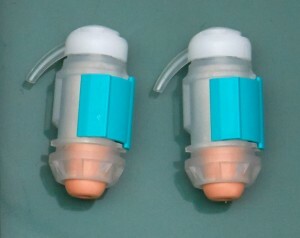 Whereas more dated models had a reputation for being loud and having clunky cords, this model is quiet and cordless, making it easier for your team to move freely around the operatory. It also comes with a charging base that has a built-in intensity meter and battery charge indicator. Bonding agents come in different “generations,” and this product is a 7th generation system – aka the shiniest and newest. 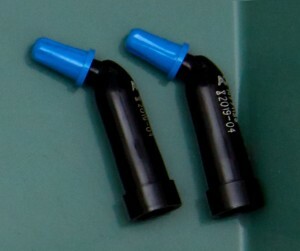 The two-component system includes a self-etch primer as well as a universal adhesive. The primer provides effective etching to enamel and dentin without the need for a separate phosphoric acid etch, while the adhesive helps reinforce bond strength. 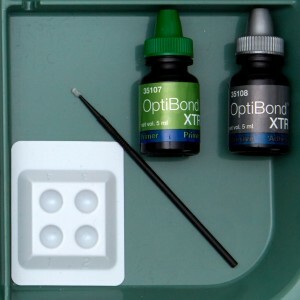 This bonding agent’s chemistry allows for compatibility with all self-cure or dual-cure resin cements and core build-up materials, meaning the doctor has ultimate control over how he/she uses it. That covers what you will love about this product, but your patients will love that the self-etch technique minimizes post-operative sensitivity and maximizes comfort! This product is a #1 seller here at Patterson, and that is due, in part, to its versatility! The visible-light activated restorative composite is designed for use in anterior and posterior restorations, and has outstanding strength for both uses. It produces an excellent polish and is available in a wide range of shades and opacities. The self-curing and self-adhesive properties of this glass ionomer restorative material make it unnecessary to perform conditioning, coating, or light-curing steps, which saves time and increases efficiency. As such, it is particularly suited for pediatric and geriatric patients – patients that tend not to sit as well at appointments. It also continuously releases fluoride for 24 months, which bolsters our recommendation to use these capsules with pedo patients! These are 3M’s newest polishers! The two-step system (pre-polishing and final polishing) imparts a beautiful diamond paste-like gloss in the convenience of a rubberized system. The Pre-Polishing Spiral prepares the surface by removing scratches and other imperfections, while the Polishing Spiral delivers the gorgeous final result. They may be sterilized and reused. We’ll ending things on a soft note with Patterson’s rayon/polyester blend gauze sponges. Much like an ant can carry several times its own weight, these sponges absorb 12 times their own weight! Their dense fiber construction and non-raveling edges make them a sturdy choice for operative procedures, while their soft texture reduces tissue trauma and abrasion. As we mentioned earlier, there are numerous ways to approach a simple composite restoration, and a variety of products to perform it with. But, there is one thing that all dental health care providers and patients are united on: the desire for trustworthy and simple solutions. 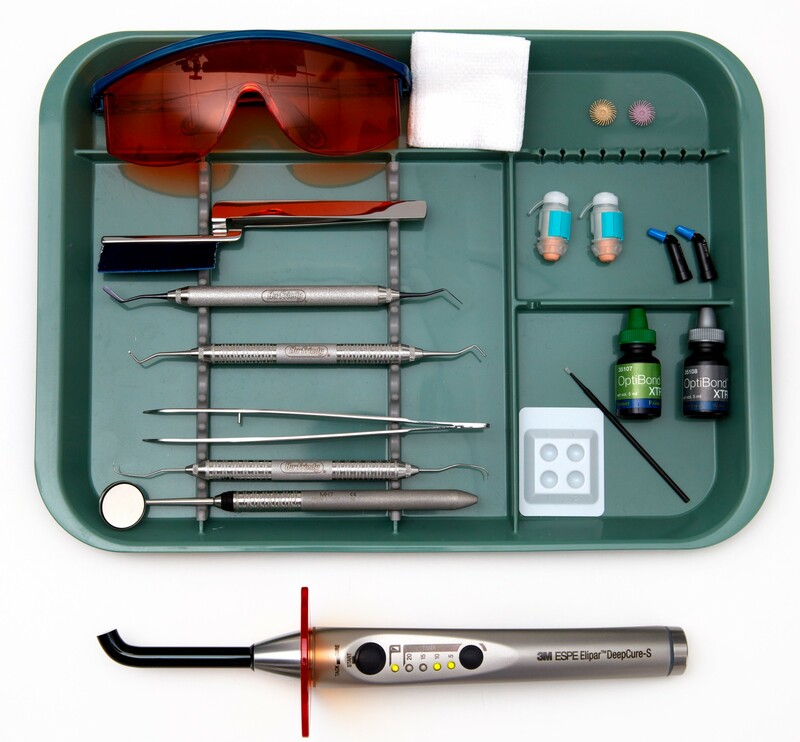 That is what the 15 products featured in our restorative tray setup will provide, and that is what Patterson strives to offer in our partnership with you: a simple and trustworthy destination for all of your professional needs.